Even though Halloween has ended, this November brings a slew of magical books. In the paranormal and dystopian department, there are new rules, new powers and new worlds that make these books ones to look out for. And if you haven’t consumed your zombie fill this October, Harlequin Teen has you covered for the next month with a new YA horror that puts a nice new spin on the walking dead. Below is a list of highly anticipated YA novels with a November 2012 release date. These picks already have great ratings on Goodreads and strong hype. As a healer, Remy has cured a number of maladies — broken bones, burns and bruises — but each injury she heals becomes her own. Asher Blackwell, a former Protector of Healers, sacrificed his senses to become immortal, and by killing a Healer, he has the opportunity to recover them. Will Asher kill Remy to gain what he’s lost? Releases November 27th 2012 by Kensington Teen. The sequel to “Daughter of Smoke and Bone” plays as coy with the summary blurb as the first novel. Karou must come to terms with who and what she is, and how far she’ll go to avenge her people. Releases November 6th 2012 by Little, Brown Books for Young Readers. Bonus Tidbit: Of the first novel, Taylor’s poetic writing brings to life an entirely new world with layers and layers of detail, mystery and intrigue. So much so that a description simply can’t do it justice. You can read an exclusive excerpt of “Days of Blood and Starlight” at EW.com. Pitched as “a dark and tender post-apocalyptic love story set in the aftermath of a bloody war.” Tensions run high between humans and Darklings. When Ash, a half-blood Darkling, and human Natalie fall in love, their forbidden feelings could mean execution. Both become tangled in a conspiracy to bring humans and Darklings back to war, and a wrong decision could end in death. Releases November 13th 2012 by G.P. Putnam’s Sons BYR. Bonus Tidbit: Prior to her debut novel “Black City,” Richards spent her early career reviewing video games. Crazy cool, right? “Black City” is also one of Penguin’s coveted Fall 2012 Breathless Reads. Five debut novels — “breathless reads” — will hit the road for a book tour in cities near you. Evelyn believes her home, an underwater utopia known as Elysium, is perfect until she meets a Surface Dweller, Gavin. Everything she knows is a lie: her memories and the control of her mind and body. She plans to escape with Gavin but learns that her mind is a ticking time bomb. Releases November 13th 2012 by Tor Teen. Bonus Tidbit: J.A. Souders’ debut novel has already circulated through the YA blogosphere with positive reviews. Giselle at Xpresso Reads says, “Renegade is the kind of book where the more you read, the better it gets. So for a book that starts already uphill, by the time I was done, I was not only on top of the hill, but I had leaped over, and into an abyss of bloody muffins.” Sounds like a killer good dystopian. In the third and final novel of the Matched Trilogy, Cassia will reconcile the difficulties of challenging a life too confining, seeking a freedom she never dreamed possible, and honoring a love she cannot live without. Releases November 13th 2012 by Dutton Childrens Books. Bonus Tidbit: The Matched series is a “New York Times” bestseller, and in a bidding war for the film rights, Disney beat out Paramount for Ally Condie’s popular dystopian love story. Molly Bartolucci wants to blend in, date hottie Rick and keep her zombie-raising abilities on the down-low. Then the god Anubis chooses her to become a reaper-and she accidentally undoes the work of another reaper, Rath. Within days, she’s shipped off to the Nekyia Academy, an elite school that trains the best necromancers in the world. And her personal reaping tutor? Rath. Who seems to hate her guts. Releases November 20th 2012 by Harlequin Teen. Bonus Tidbit: With so few YA horror books being released a year, it’s nice to see another being available so close to Halloween to keep the spirit of the spooky holiday alive. 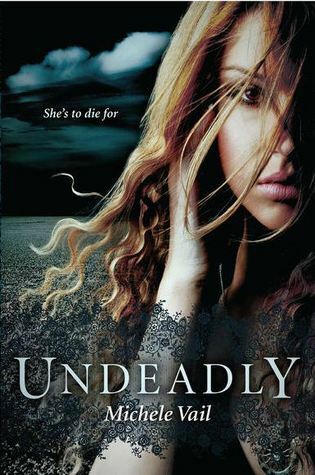 “Undeadly” is Vail’s debut novel and the first in The Reaper Diaries series. Which November release sparks your interest?